The Compaq R3000 laptop (512MB RAM, 60GB HDD) we use as a communal machine in the kitchen is showing its age. It is after all eight years old – well past the normal retirement age for computers that I own. But this little beast has grown on me and I really don’t want to put it out to pasture just yet. I have personally brought it back from the dead twice. Once its backlight failed (a common issue with this model) and I managed to source a new backlight and install it myself. Then the power socket failed (another common issue) which a bit of solder fixed. So after all this time and effort, it just doesn’t seem right to replace it. Also, its a nice shade of grey which matches our kitchen decor nicely ;-). Some years ago I gave up using the pre-installed Windows XP home on it (as it was just too painfully slow). I tried dual booting various flavours of Linux. Starting with Ubuntu, Mint, Puppy and then finally Lubuntu – a special version of Ubuntu made for low end machines. Even with this lightweight Linux on it, basic tasks were just getting too much for the poor thing. Loading more than a few tabs in Chrome was unbearably slow. Running flash was completely out of the question. Leaving Chrome loaded for more than a day would result in lots of disk activity (most likely paging) followed by a forced reboot if you were in a hurry and actually needed to do something. Overall not a good user experience. My wife finally convinced me that it was time for an upgrade and I started pricing some new Dell machines and even contemplated a MacBook. Having nothing to lose and against my better judgement, I decided to have one more bash at getting it working by installing another OS – again. This time though not with another flavour of Linux (why are there so many these days?) but good old Windows XP. You know that old OS that apparently no-one uses anymore. Before I performed this act of “operating system heresy”, just to be sure, I made two backups of the old Windows partition using Acronis True Image and also converted the whole thing to a VMWare virtual machine (more on that in a later post). I managed to source a slip-streamed copy of Windows XP SP3 including all updates and useful tools like Flash and Java. Its easy to find, use google. Booting the CD was simple and I got Windows Setup to completely erase the drive and make one new partition and installed Windows XP SP3 to it. Windows XP SP3 found all the devices automatically (unlike Linux) and I was up and running in about an hour from first boot. A fresh install of Chrome and Microsoft security essentials and I was ready to admire the latest incarnation of the R3000. Of course everyone knows that reinstalling Windows fresh can improve performance but I had never thought going “back” to good old Windows XP would have such an impact. The best part is of course ALL software still runs on XP. Standby mode works so the thing is not pulling power when its not being used (most of the time). This is something Linux still finds hard today. 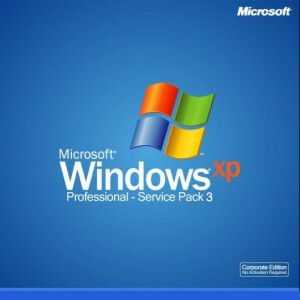 Windows XP celebrates its tenth birthday later this year. Think about that for a minute. PCs have been around for 30 years and for one third of that time the vast majority of them have been running one single operating system. No other operating system has had such longevity. Its not surprising it remians so popular. What the Microsoft engineers managed to get Windows XP to do with so little resources is simply amazing. Its something the Linux community seem to have forgotten. They seem to have ignored compatibility in favour of eye candy. What’s the point of having a really pretty gnome desktop but no Wifi or power management on a laptop? Especially if its going to need 4GB of RAM to boot? I don’t have time to go and find drivers and configure kernel modules – I just want it to work. You might as well continue to run Windows 7 or Mac OS as they come “free” on all new machines anyway. If you have an old machine that you wan to breathe new life into, try a slipstreamed version of Windows XP SP3 before heading down the Linux path. Its truly worth it. Thanks for the article. I think you should give Puppy Linux another go. I think you’ll find it a refreshing change of pace. I have been an IBM Thinkpad fan for many years and I concur with your article. I also tried the various flavours of Linux and also Win 7, but XP seems to work very well and often.